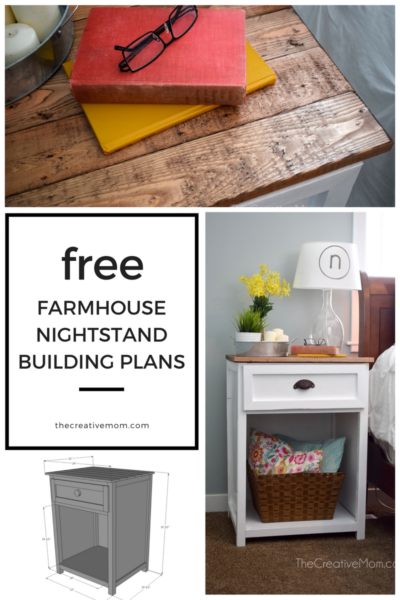 I am SO excited to share my farmhouse nightstand with you today! 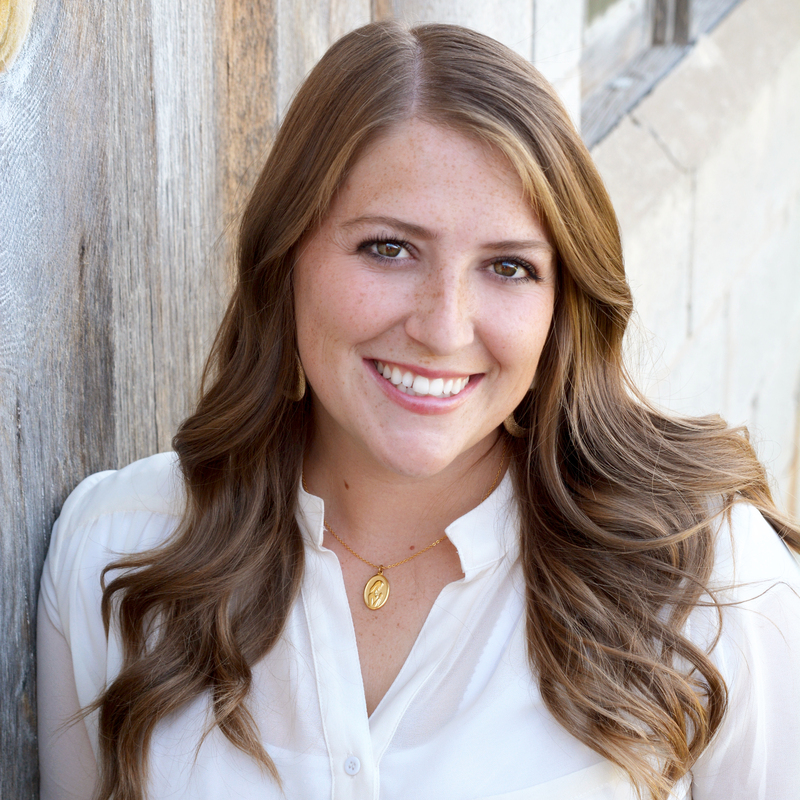 It’s no secret I love me some farmhouse style! I love furniture with a bright white base and a dark wood top. No kidding, Every piece of furniture I’ve ever built is this way. 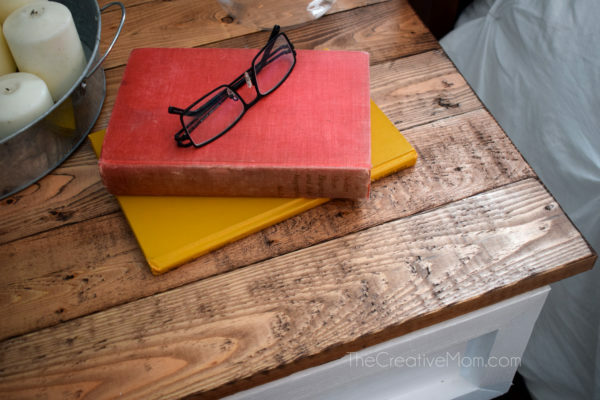 My Ikea hacked coffee table, my desk, our entryway bench, even our kids’ toy box is farmhouse style! 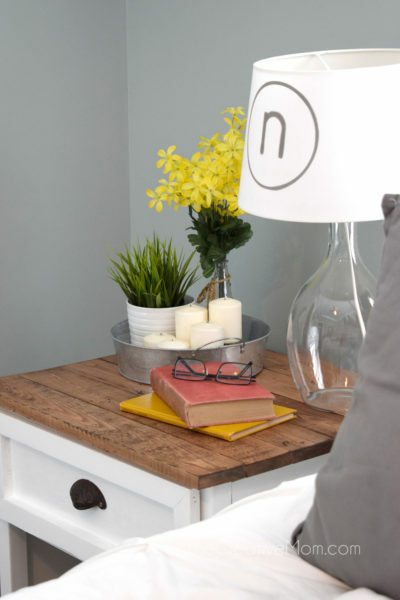 So when we needed new nightstands in our bedroom, I knew exactly what I wanted- a farmhouse nightstand! That’s right, I wanted this to fit in with every other piece of furniture in my home! Oh boy, I think I have a farmhouse addiction. 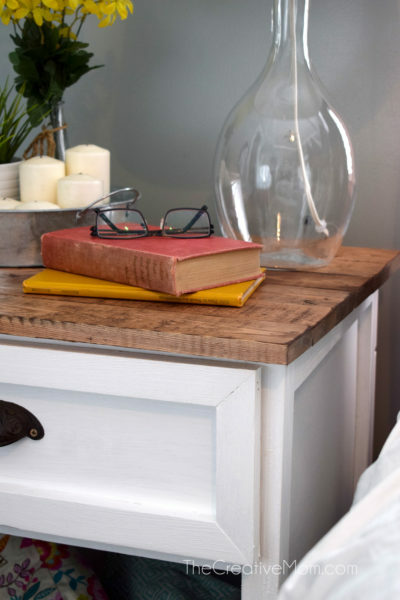 I feel like ths farmhouse nightstand is something Joanna Gaines herself would have picked out- and of course Clint Harp would have built it for her! I am honestly obsessed with the way these bedside tables turned out! The shape of this piece is so clean and sleek. It pairs so perfectly with the rustic look of the top. That drawer pull gives me all the heart eyes, and the space for the basket in the bottom is so perfect for my needs! This is a pretty easy build. 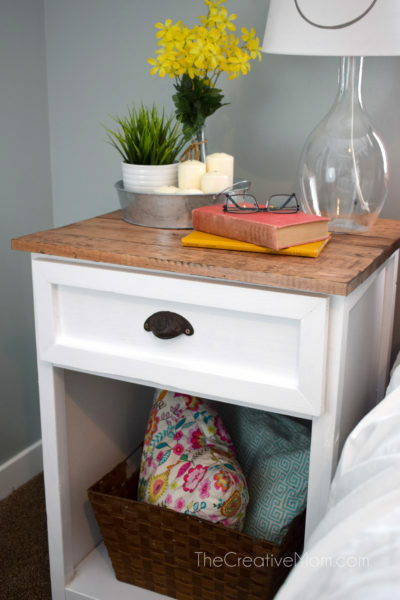 If you’ve ever built anything before, then this farmhouse nightstand will be a breeze! This might be a challenge if you haven’t built before, but honestly, it’s not as hard as it looks. If you’re just starting out building furniture, I would recommend starting with my farmhouse bench, then give these guys a try. You’ll get addicted, I promise! 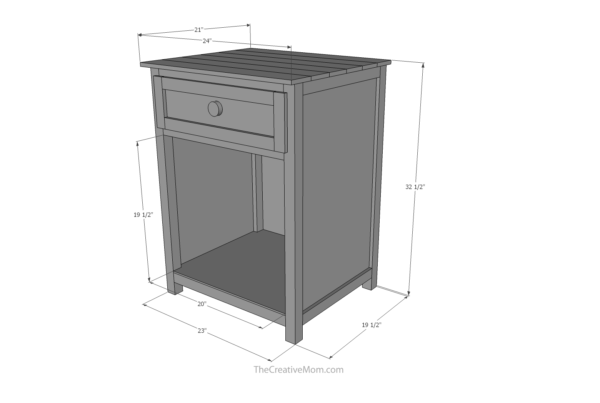 My favorite thing about this farmhouse nightstand is that it is extra tall (32 inches! ), so it fits perfectly beside my super tall bed! I had a lot of requests for a tall nightstand, because you just can’t seem to find them in stores. I also love that gorgeous wood planked top! You guys know I love me some wood plank! Gosh, guys, isn’t it gorgeous! 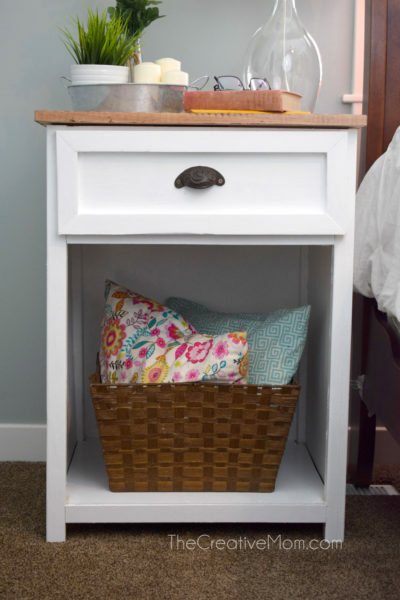 Painted furniture is so pretty and clean, but there’s nothing like a good wood grain! I partnered with BuildSomething.com to design this nightstand. Build Something is Kreg’s new building plan site (you know, the Kreg Jig people). They have all sorts of free building plans, including a bunch that I designed (check them all out here). You can get this complete building plan for free on their site. I would love it if you would hop on over to BuildSomething.com and take a look at my plans I’ve drawn. Maybe you’ll find something you just can’t live without, and you’ll be able to build it yourself! If you like this type of furniture, make sure to check out some of my other farmhouse furniture (most of them have free building plans). Just type “farmhouse” in the searchbox on my sidebar (over there –>). 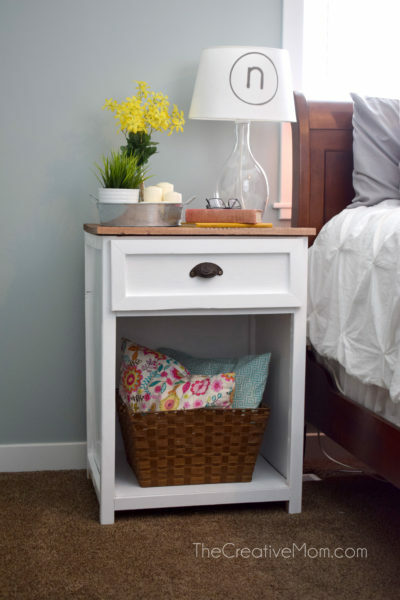 Would you use these night stands as end tables in the living room. ? I love the look of them.